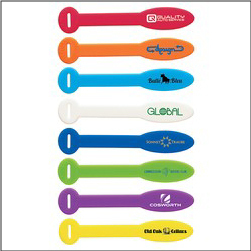 Order Custom Printed Multi Use Silicone Tie Tags – these versitile tags can be used to tie computer cables, as luggage tags, racing promos, booster support etc. Additional popular uses of these tie-offs include: wine glass and bottle markers, hotel and casino bag markers, school use, tool organization, trade show and event promotions, and more. Available in Orange, Yellow, Red, White, Blue, Lime, Light Blue, and Purple.